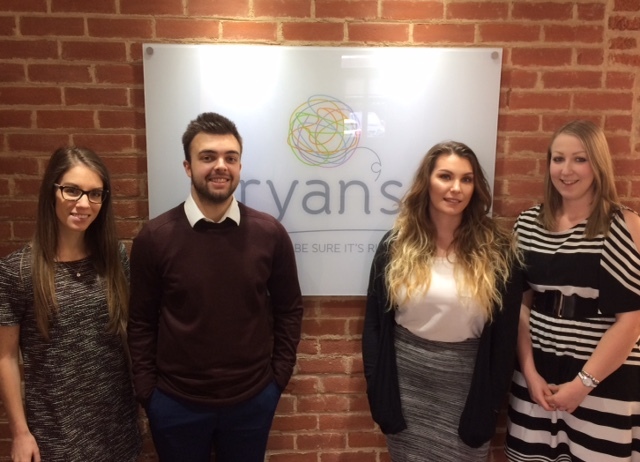 At Ryan's we have been successful in recruiting and progressing trainee's for a number of years and we are looking to do this again. So if you, or someone you know, is looking to get into customer service and insurance, wants to work in a vibrant office and would like a job that develops skills and gives opportunities for progression, we have an exciting opportunity for a Trainee Adviser. See attached job specification for details. All training will be given and you will be required to study for your insurance qualifications. Contact Nicci Dedman-Munro by email or call 01473 343304. Chloe joined Ryan's in 2013, she now has her certificate and diploma in insurance and works as an Account Handler in our Corporate Division. Robbie joined Ryan's in 2016, he is currently studying for his certificate in insurance and works as a Customer Adviser in our Private Clients Division. Emily joined Ryan's in 2015, she is also currently studying for her certificate in insurance and has passed her first exam. She also works as a Customer Adviser in our Private Clients Division. Laura joined Ryan's in 2007, she works part time in our Sales Team.